The international privacy action day on Saturday was a total blast. I was speaking at the demonstration in Berlin, and you just can not imagine how it feels when 100 000 people are shouting "we are here, we are loud, because they steal our data!". Yesterday, the first worldwide protests against surveillance measures such as the collection of all telecommunications data, the surveillance of air travellers and the biometric registration of citizens were held under the motto "Freedom not Fear - Stop the surveillance mania!". In at least 15 countries citizens demanded a cutback on surveillance, a moratorium on new surveillance powers and an independent evaluation of existing surveillance powers. "A free and open society cannot exist without unconditionally private spaces and communications", explains an international memorandum. 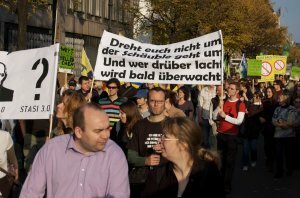 In Berlin the greatest protest march against surveillance in Germany's history took place: Participants in the 2 km long, peaceful protest march carried signs reading "You are Germany, you are a suspect", "No Stasi 2.0 - Constitution applicable here", "Fear of Freedom?" and "Glass citizens, brittle democracy". Apart from related music tracks, loud chants of "Belittle it today, be under surveillance tomorrow" or "We are here and we are loud because they are stealing our data" could be heard. 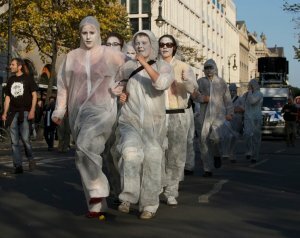 During the protests, which were supported by more than 100 civil liberties groups, professional associations, unions, political parties and other organisations, artists played parodies on surveillance society. In their final speeches in front of the Brandenburg Gate, the organisers called for political consequences: padeluun of civil liberties group FoeBuD said that in view of the mass protests politicians needed to react now and repeal the blanket retention of all telecommunications data introduced in 2006. Patrick Breyer of Arbeitskreis Vorratsdatenspeicherung presented a five point plan according to which surveillance should be reduced, existing laws should be evaluated and plans for new surveillance measures should be halted. In the course of a "new, freedom-loving security policy" specific preventive measures such as youth projects should be invested in and the "real problems" of people such as poverty and education should be focused on. Ricardo Cristof Remmert-Fontes of Arbeitskreis Vorratsdatenspeicherung announced further action and invited participants to join parties held in seven participating clubs in Berlin under the motto "The long night of surveillance". In other countries, the following events took place in the course of yesterday's "Freedom not Fear day": Protest event with music and several art performances in Den Haag, lectures in Rome, surveillance camera mapping in Madrid, art performances in front of Parliament in Vienna, protest rallies in Paris, Prague, Sofia and Stockholm, the distribution of privacy software in Kopenhagen, informative events in Guatemala City and Buenos Aires as well as a light projection onto Toronto's Town Hall. In London, the construction of a surveillance state was protested by creating a massive collage of photos on Parliament Square showing the prime minister and the action day's motto "Freedom not Fear". Before the action day, Arbeitskreis Vorratsdatenspeicherung had warned of a "surveillance avalanche in Germany": According to the group, the German parliament has tightened surveillance and control over citizens at least 21 times in the past 10 years. At least 18 more surveillance proposals are presently on the political agenda, for example the blanket collection of air traveller's data and the transfer of personal data to the US. More reports, videos etc. are here. I hope you're right with the title of your blog entry and that we will witness more of these events - not only in Germany and not only for a few months or years. This would provide the political pressure NGOs, individuals and public bodies (e.g. Data Protection Officers) concerned with privacy issues.